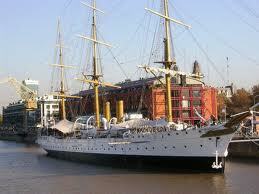 Between 1899 and 1938 it was the "Buque Escuela" of the Argentine Army (military training ship), making thirty seven instruction trips. This frigate´s boards bear marks of the waters around the world: estimates say the distance it has travelled is commensurate with 42 trips around the globe. Historical characters such as Kaiser William II of Germany or Tzar Nicholas II of Russia visited its facilities. It also took part of kings Edward VII of England and Alfonso XIII of Spain´s coronations and shared in the festivities for the Canal of Panama´s opening. It was madeover into a museum in 1961. Everyday, 10 to 21. Dock 3. Puerto Madero. Te. 4334-9386.